Earn $0.97 in Podium Club credit (97 points)What's This? 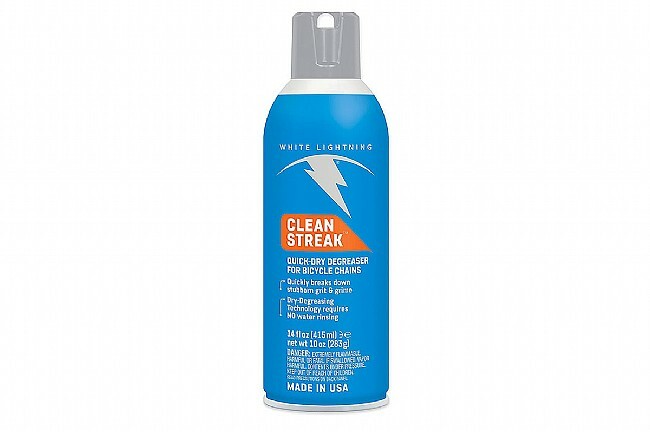 Clean Streak™ Degreaser from White Lightning is a quick and effective aerosol degreaser best suited for bike parts. With just Clean Streak™ in hand (and no water source, as rinsing isn’t necessary), this degreaser works fast to break down and wash away stubborn grease, road grime, and dirt and then dries in just minutes with no residue. Clean Streak should be used outdoors or in a well-ventilated area, and over an old rag or newspapers to catch grease and grime as it flushes off parts. Does a good job spraying grease from chain and derailleurs. Only problem is how fast you can use up the can if you clean the bike every week or so. I use this before the PArk fluid as a preclean, to get in between the chain links. It helps, but is really a luxury.